A few minutes later, WDM2 #17739 of Pune - in a very bad condition - pulled in with the passenger. The loco was in brown livery last year, and even the new livery showed signs of the old livery. Just as the passenger cleared in, WDM2 #18354 and #17608 of Kalyan pulled in with a TP rake. The train came to a dead halt a bit before the starter (the starter was red). Just as the loco stopped, the signal turned green. A pointsman rushed to hand over a few caution orders. The loco notched up, and maximum power was applied. The rake slowly inched forward! It took about 5 minutes for the rake to clear the platform! Just minutes after the tanker moved out, WDM2 #17628 (without any logos) pulled in with a tanker rake carrying "Liquid Ammonia". Just as the loco passed me, I noticed " CR PA " painted on the cabin. That meant that the loco was of Pune DLS! She was probably out of a POH at Parel. Each wagon in the rake was in a very poor state with the paint peeling out, and signs of corrosion was evident. The rake smelled badly of ammonia. After the rake cleared, there was negligible traffic for the next 20-odd minutes. About 2 CSTM Bound EMUs were cancelled, and a handful of others were running late. Announcements were made about the arrival of Matsyagandha Express at around 1430. The train made her appearance at around 1434. WDM2 #17676 of Erode was doing the honours. After a quick photo, I rushed over to board the train. Just as I boarded the train, WCAM3 #21945 pulled in with the Varanasi-Mumbai Mahanagari Express. My train moved out at around 1440. We crossed a CSTM bound EMU at the home signal. WCAM3 #21887 was waiting at the outer signal with the Hyderabad-Mumbai Express. The run ahead was normal. The loco was a beautiful smoker, pushing out loads of smoke everytime she notched up! We crossed two north bound Container trains on the way (both hauled by WAG7s). We pulled into Panvel at around 1521, and stopped on Platform 3. The loco was refueled and was now ready to move out. A Pune WDG3A was waiting to proceed towards Diva with a Container train. 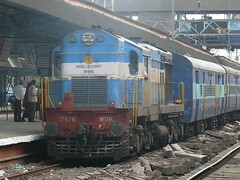 A twin Kalyan WDM2 was waiting to proceed towards Thal wit ha Naptha rake. I took a bus back home from Panvel. There ended another short session. Images of the day are here. They are the last 12 images of the page starting with this one.